The Sistema de Aprendizaje Tutorial, which originated in Colombia, is most commonly known by its acronym SAT (rhymes with “cat”), translates into English as the Tutorial Learning System. SAT is an alternative secondary school program offering grades 7-12 for young people living in isolated, rural communities in five countries in Central and South America. It provides a relevant, flexible education in areas without access to traditional secondary schools. It is said that “SAT students learn for life; others learn for exams,” a sentiment shared by Heriberto Flores, former director of education for Lempira State in Honduras. Like many other government officials, Flores became an ardent supporter of SAT after visiting the program and witnessing results first hand. Such support from local and national governments has been critical to the program’s success. SAT was first developed in Colombia in the late-1970s, by the NGO Fundación para la Aplicación y Enseñanza de Ciencias (Foundation for the Application and Teaching of the Sciences, or FUNDAEC). It was conceived of as a development project wherein education would provide people with the knowledge and skills they needed to positively impact their communities, and this remains its guiding principle. 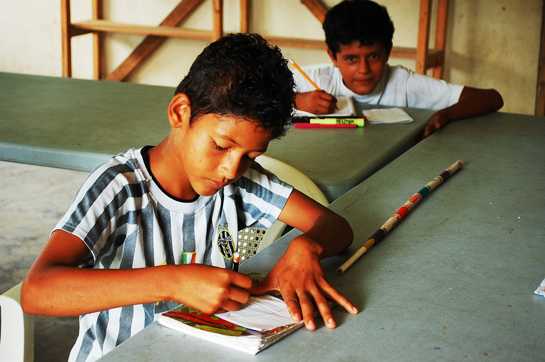 Today, SAT is implemented in Colombia, Honduras, Nicaragua, Brazil, and Ecuador, and Guatemala also hosted an SAT program until 2005. Together, an estimated 300,000 young women and men have completed the program in these countries. While implemented by local NGOs, SAT is accredited as an official secondary education program. It has been adapted to other countries in Asia and Africa as a sister program known as Preparation for Social Action, or PSA. Why is Millions Learning interested in SAT? For Millions Learning, we have been intrigued by SAT and interested in understanding its experience for various reasons, including: its expansion and adaptation across countries; the robust evidence of its impact; and its cost-effectiveness relative to other alternative secondary school programs. Furthermore, an impact evaluation in Honduras found that SAT students outperform their peers in other alternative schools on test scores. Evidence also suggests improvements in broader skills, such as promoting civic responsibility, empowering girls, and building trust. SAT achieves these results while focusing on some of the most educationally marginalized and difficult to reach young people, most of whom are often beyond the reach of government schools. The program has withstood the test of time, having existed in some countries for more than 15 years, and with aspects of it incorporated into some national education systems. SAT seems to become more sustainable as more young people graduate from its program, because many such graduates then return to become SAT teachers, known as tutors. This terminology is an important distinction at SAT, and reflects tutors’ responsibility to help facilitate and guide the learning process rather than just impart information. SAT falls on one end of a continuum of case studies that we plan to review for Millions Learning. It is not a national-level education reform where incremental, albeit important, changes have been made around the edges of the larger system. Rather, it is an “education revolution,” according to Soheil Dooki, the director of Asociación Bayán, the NGO that implements SAT in Honduras. In SAT, it is considered important to learn things broader than just traditional academic skills; there is a strong emphasis on analysis, inquiry, community service, and moral and character development. SAT has been developed with the “end-user” in mind. SAT’s schedule is determined by each community, and accounts for when students need to participate in agricultural activities that are the primary income in most of these countries’ rural areas. Tutors at SAT are hired and managed by an autonomous NGO, and receive ongoing training in the specialized SAT curriculum. This curriculum, rather than traditional subjects, focuses on five capabilities that are considered relevant for life in these communities: math, sciences, language, technology, and service to the community. Students stay with the same teacher for all six years and participate in hands-on learning, incorporating academic theory into relevant agricultural practices. SAT occupies a delicate space between government support and civil society autonomy. For example, in Honduras, SAT is a formally recognized alternative education program, which means that students graduate with the equivalent of a secondary school degree. Additionally, the Ministry of Education pays for the salaries of tutors at SAT centers while Asociación Bayán is responsible for hiring, training and monitoring them. We found that the importance of this partnership—and the distinct role of each partner—cannot be overstated. Integral to SAT’s success has been: the role and autonomy of a well-managed NGO in implementing the program; the political and financial support from the government; and the buy-in, participation, and ownership from the community. SAT’s success has not come without challenges. Alternative education is still considered an inferior option to traditional public schools in many of these countries. In Honduras, because most of the tutors are not considered permanent teachers, their salaries come from a discretionary government budget that is less stable and as a result, payment can arrive late. At a more philosophical level, anything that appears to be challenging the status quo, or changing mindsets of how learning is conceived, can face its fair share of critics and opponents. Expansion of SAT has also been slow and carefully controlled so as to consider the balance between growing and maintaining program quality. We look forward to sharing more of what we learn from SAT’s experience—what appears to be behind the program’s success, as well as the challenges confronted and adaptions made along the way. As part of this blog series introducing each in-depth case study, we welcome your thoughts and reactions on the specific cases or larger themes that are emerging. Jenny Perlman Robinson is a nonresident fellow with the Center for Universal Education. Formerly Senior Program Officer at the Women’s Refugee Commission, she focuses on policies and practices that improve educational opportunities and outcomes for girls and boys in developing countries.